If you were wandering through Indiana University’s Woodburn Hall and didn’t know any better, you might miss the small plaque that says Halleck Room. Even if you did happen to notice it, the sign gives little indication of what sits behind the nondescript door–usually locked, by the way–in the middle of a side hallway on a random floor. Walking by, you’d likely assume it to be a small meeting room named in honor of someone important to the university years ago. You’d be forgiven for such an assumption, though: The banality of it all belies the fact the room actually houses a replica of the office of one of the most colorful–and most powerful–Hoosiers to hold office in the last century. Filled with some personal belongings, professional possessions, and furniture from the U.S. Capitol, it serves as a sort of one-room museum for former U.S. House Majority Leader Charlie Halleck. Charles Abraham (Charlie) Halleck was born in DeMotte (Jasper County) on August 22, 1900, and grew up in Rensselaer. He was introduced to politics at an early age: Abraham Lincoln Halleck, his father, was a county commissioner when Charlie was born, and soon thereafter would serve two terms as a state senator. After a short stint as an Army infantryman at the tail end of World War I, the younger Halleck earned an undergraduate degree from Indiana University in 1922, followed by a law degree from there two years later. Upon passing the bar, he moved back to Rensselaer to practice law. Within a year, and at the age of just 24, he became the prosecuting attorney for the 30th Judicial Circuit, a post he would hold for ten years. In 1934, former Congressman Frederick Landis was attempting to make an improbable political comeback: First elected to Congress in 1902 and again in 1904, he lost his bid for a third term in 1906. In the ensuing 28 years, he helped found the Progressive Party before it quickly fizzled out, and he suffered failed bids for both Lt. Governor and Governor. When FDR carried Indiana by double digits in 1932, Democrats rode his coattails to win every Congressional seat in the state. 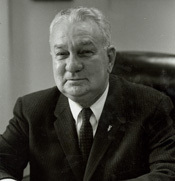 Unfazed by his losing streak and the political environment, though, Landis ran in the 2nd District and was the only Hoosier Republican to win a Congressional race in 1934. Despite overcoming such odds, though, he never made it back to Washington: He died nine days after the election. When a special election was called to fill the seat, Halleck decided to run. 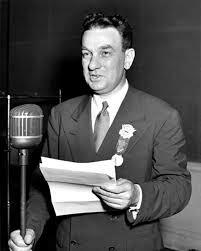 He won, and was sworn as a member of the 74th Congress on February 5, 1935. As Indiana’s only Republican member of the House, he often joked that he held his caucus meetings in a phone booth. During his first few terms in Congress, he frequently railed against FDR’s New Deal programs and what he saw as excessive federal spending, making a name for himself as a rising leader in the nascent Conservative Coalition of southern Democrats and conservative Republicans. Despite this, he was still a backbencher who told constituents he was just the GOP’s water boy. As Halleck’s stature continued to grow, he was named the Chairman of the National Republican Congressional Committee (NRCC) for 1943-44, and again for 1945-46. In this role he orchestrated a 54-seat pickup in the 1946 midterms, putting Republicans back in control of the U.S. House for the first time since 1931. He was rewarded for his efforts with election to Majority Leader under Speaker Joe Martin. But just two years later, his fortunes changed on multiple fronts. 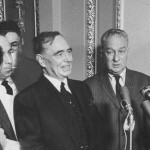 Halleck thought he had an agreement with New York Governor Thomas Dewey: At the 1948 Republican National Convention Halleck would get the Indiana delegation to back Dewey for President, and in return Dewey would name Halleck his running mate. While the Indiana delegation unanimously supported Dewey, Dewey instead chose California Governor Earl Warren to run for Vice President. To add insult to injury, Dewey would go on to lose the election to Harry Truman in surprising fashion, and along with him Republicans would lose control of the House. Just months after he thought the Vice Presidency was within his reach, Halleck suddenly found himself without a leadership post. 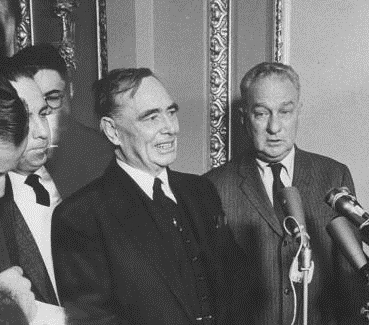 In 1952, Halleck’s career would again flirt with presidential politics when he made Dwight Eisenhower’s short list of five potential running mates. Though not Halleck, Ike’s eventual choice wasn’t all bad news. 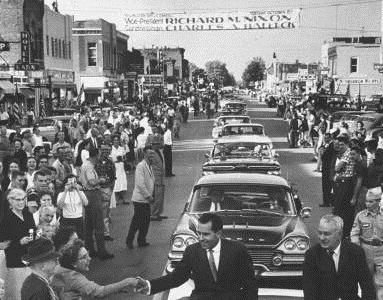 As NRCC Chairman in 1946, one of his candidates was a former Navy officer named Richard Nixon. Halleck was so impressed with the young man’s abilities that he helped Nixon secure a seat on the House Un-American Activities Committee (HUAC). Nixon’s HUAC investigation into Alger Hiss would make him a household name, and ultimately help springboard him onto Eisenhower’s ticket. When Republicans won the White House that year, the friendship between the two men would ensure that Halleck remained one of the most important Republicans in Congress, leadership post or not. As it turned out, Eisenhower’s landslide victory carried Republicans back into a House majority. Martin was again elected Speaker, and Halleck reassumed the Majority Leader title. When they lost the majority, again after just two years, Martin created an unofficial Deputy Minority Leader role just for Halleck out of respect. Along with his new job, he was also allowed keep his office in the U.S. Capitol. So important was Halleck to the Eisenhower administration that he was asked to deliver the nomination speech for the President at the 1956 Republican National Convention. 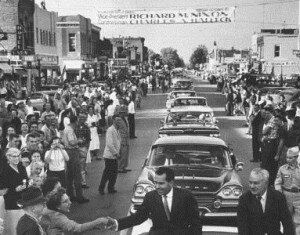 By 1959, Halleck had tired of playing second fiddle to Martin, and had tired even more of the Republicans’ continually losing seats in Congress–including 48 in the 1958 midterms alone. After getting the Republican Conference rules changed to allow a secret ballot in leadership elections, and with the quiet support of his old friend Nixon, he launched a challenge against his long-time leadership partner. Martin was caught off-guard, and was more surprised when the White House stayed silent. Halleck had him out-flanked, and was able to claim the job of Minority Leader for himself. In 1960, Halleck would see his friend Nixon narrowly lose the Presidential election. 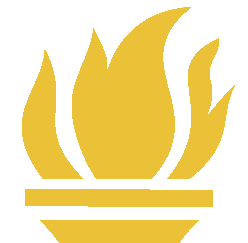 As a result, his role shifted from chief legislative broker for the White House to loyal opposition against the White House. 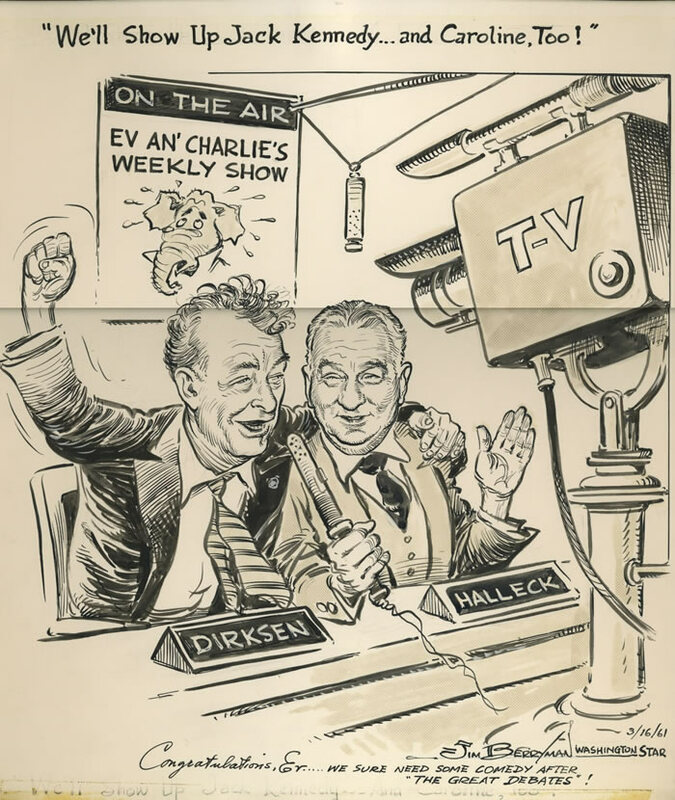 Along with Senator Minority Leader Everett Dirksen, he held a televised weekly press conference to rail against the liberal agenda of John Kennedy which the press dubbed The Ev and Charlie Show. Initially meant as a disparaging label, the pair embraced the moniker and their outsized personalities won over the media. National newscasts often led with clips from the Thursday morning routine, and the duo quickly became household names in a way previous Congressional leaders–especially in the minority party–never had. 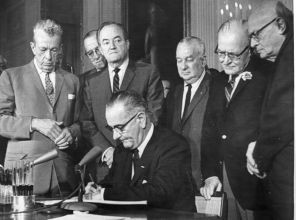 Though Halleck often continued to join forces with the southern Democrats in the Conservative Coalition to block some of Kennedy’s initiatives, he still respected his old negotiating partner LBJ enough to cut a deal from time to time. 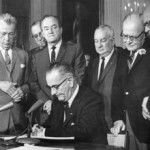 But when he made a deal with the White House to ensure the Civil Rights Act would pass the House in 1963, he told Kennedy, “I got a little trouble on my side, a lot of guys bitching … and so I ain’t sure they’ll make me leader again but … I don’t give a damn.” It was a prescient remark. The next year, mirroring his rise to national prominence 24 years before, he would give the nominating speech for Barry Goldwater at the Republican National Convention. Like Willkie, Goldwater would go on to get demolished in the election. In the midst of the electoral carnage, House Republicans would only retain 140 seats. A group of newer Congressmen calling themselves the Young Turks were ready for a change. Led by Gerald Ford and Donald Rumsfeld, they successfully ousted Halleck as he had done to Martin six years prior, and installed Ford. 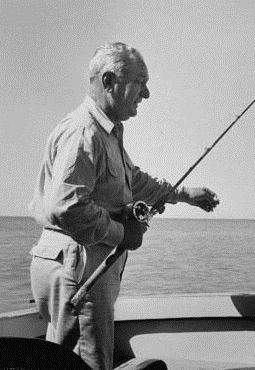 During a Montana fishing trip in 1973, Halleck’s wife, Blanche, fell from the boat and drowned. Distraught, he headed back to Rensselaer to quietly live the last thirteen years of his life. In 1986, after a bout with pneumonia, he died in Lafayette at the age of 85. As Halleck was leaving office and moving home, he wanted his alma mater to have some of his things and asked them to set up the replica office. He ripped out the carpet, took his couch and desk, packed up the items on the walls, and shipped it all to Bloomington. He checked in from time to time as they reconstituted his work space, making sure the mounted ducks he’d shot were hung in the correct spot, and griping when they laid the carpet out with the pattern running east-west instead of north-south. If you manage to get into the office today, it still remains largely as he helped assemble it decades ago. Anyone who has visited a Congressional office will immediately recognize the style of black leather couch. Faded pictures with long-forgotten VIP’s dot the room. Fish hang with engraved plates to commemorate his best angling adventures from the 1930’s and 1940’s. 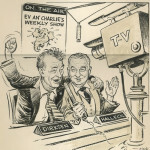 Oversized editorial cartoons, framed and signed by the artists, recall an era when Halleck was powerful enough to lampoon. And sitting just off to the side from his desk sits a liquor cabinet, unused for decades and filled with dusty barware etched The Clinic. Like the office it sits in and the man who once occupied it, there’s little to indicate the importance it once held to American politics.